It is summer, 1944. The sun shines on Normandie hedgerows. Gentle wind, fields of bright flowers, and in the background, the romantic staccato of machine gun fire in the morning. In these typical French countryside landscapes, thousands of men are about to fight. And die. Bravely like heroes, or cowardly like wussies. But only heroes really matters. Those you see in Hollywood classic war movies. This is whereHeroes of Normandie draws its inspiration; here is what the game has to offer: explosive and fast-paced battles; the pleasure of destroying your enemies with streams of hot lead from your MG42, or crushing nazi bastards under tons of mortar shells... Basically, blood and guts and glory! Heroes of Normandie is a new, fast-paced WW2 strategy wargame inspired by Hollywood war movies. This is a tactical scale board-game for 2 players, each commanding their own armies. The Germans on one side, the Americans on the other. Players deploy their units, secretly plan their attacks and try to ouwit their enemies by blocking their strategies and surprising them. One thing’s for sure: there's no turning back! 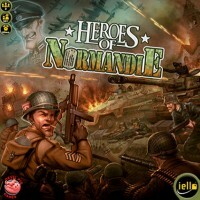 Add a Review for "Heroes of Normandie"